There are information resources in or near every ferry terminal: Woods Hole, Hyannis, Vineyard Haven & Oak Bluffs. The Martha's Vineyard Chamber of Commerce office at 24 Beach Road (PO Box 1698), Vineyard Haven MA 02568 (tel 508-693-0085 or toll free 800-505-4815), is located a few doors down from the Tisbury Inn off Main Street (map). The chamber publishes a very helpful and complete visitor's guide, as well as a list of summer events, and can also help you with Martha's Vineyard summer rentals. There's an information desk in the Steamship Authority's dockside ticket office in Woods Hole (map), so you can find out some things even before getting to the island. As soon as you arrive on Martha's Vineyard, pick up a copy of This Week on Martha's Vineyard (a pull-out section of the local newspaper). This Week has listings of the church-sponsored white elephant sales, musical concerts (many free), lectures, dances, movies, tournaments (kite flying, fishing, table tennis), community sings, and the like. Two other free papers, Island Light and Vineyard Summer, can be picked up in most shops. 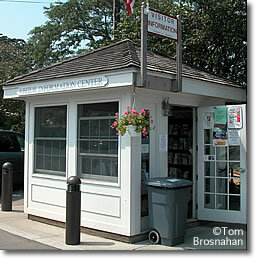 The tiny Visitor Information Center by the bus stops and ferry docks in Vineyard Haven, Martha's Vineyard MA.